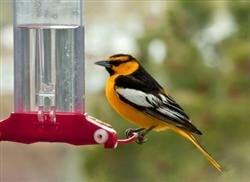 The Bullock's Oriole is the western counterpart to the Baltimore Oriole the bird found east of the Rockies. 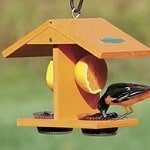 In the mid-1980's ornithologist concluded that the two are one bird species, and united them under a new name: Northern Oriole. 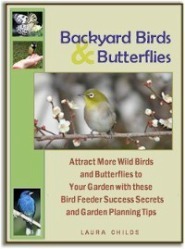 Migrating northward in spring from their wintering grounds in Mexico and South America to claim territory, find mates, nest, and raise their young. These birds nest as far north as Canada. 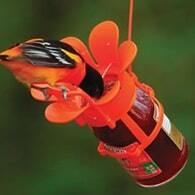 These birds measure about 7 - 8 1/2 inches in length. The male bird has an orange face with a black eyeline and a large white wing patch. Less black on its head than the Baltimore. A black eye line can be seen on the males. A bold white patch on the wing and entirely orange outer tail feathers. 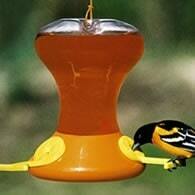 The female has a yellowish head and breast with a whitish belly. Immatures look similar to females. The nest of these birds is best seen in winter when the trees are bare. Like its eastern counterpart, Bullock's have the signature woven hanging nest, suspended from the very tips of branches. Made of tightly woven plant fibers and string. Placed 6 - 60 feet above ground. The female lays 4 to 6 eggs that are pale bluish white with dark marks. Incubation is done by the female and last 12 - 14 days. The young will leave the nest in 12 - 14 days after hatching. 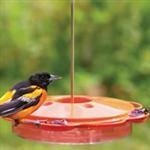 These orioles eat insects, fruits, flower nectar and will readily come to fruit feeders. 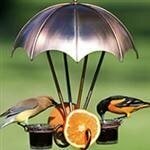 Bird watchers might place orange halves, sugar solutions, and grape jelly to attract them for a close-up look.